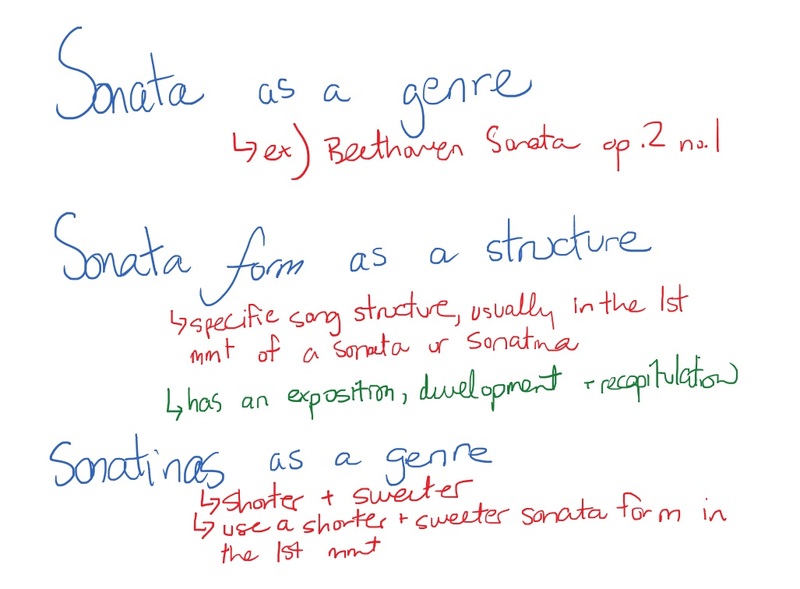 We’ve talked about Sonata form on this channel before – not to a very detailed, specific extent, but enough to get the gist of ‘em. Today we’re going to talk about sonatinas, which are just small sonatas. In general, sonatas are large, complex works that you won’t be ready to tackle until an early advanced level, but sonatinas are doable from a grade 3 level onward. They act as a bridge, helping you to eventually get to the more difficult sonata. But don’t be fooled! Sonatinas aren’t easy. They require dexterity, fast fingers, attention to small details, and lots of movement. Aside from being a bit easier than sonatas, sonatinas also tend to have a lighter sound as well. You’re not going to hear anything remotely resembling the weighty Beethoven sonatas in these miniatures. The term ‘sonatina’ hasn’t been used consistently over time. Nowadays, we think of a sonatina as a short and easy sonata. But in Bach’s day, he referred to a sonatina as a short introductory piece. And sonatinas aren’t necessarily easy – Alkan’s sonatinas will attest to that. Probably the most famous collection of sonatinas are Clementi’s opus 36. These are suitable for intermediate-level players, ranging from level 3-7. We already discussed Clementi himself in a previous video, and in the not-too-distant future we’ll be doing a tutorial on one of his sonatinas – stay tuned for that! There’s a difference between a sonata as a genre, and sonata as a form. This is where things get a little confusing. A “sonata” can refer to an entire composition – such as Beethoven Sonata op. 2 no. 1. But the word sonata also means a structure. So for example, in a sonata, the first movement is generally written in sonata form. As we talked about in the sonata video, sonata form features an exposition, development, recapitulation, and other specific twists and turns. Definitely freshen up on that if you don’t remember, or missed the video. The reason I bring all this up is because the same is true of sonatinas. The word “sonatina” refers to a genre of composition, such as Clementi’s Sonatina in C, op. 36 no. 1. 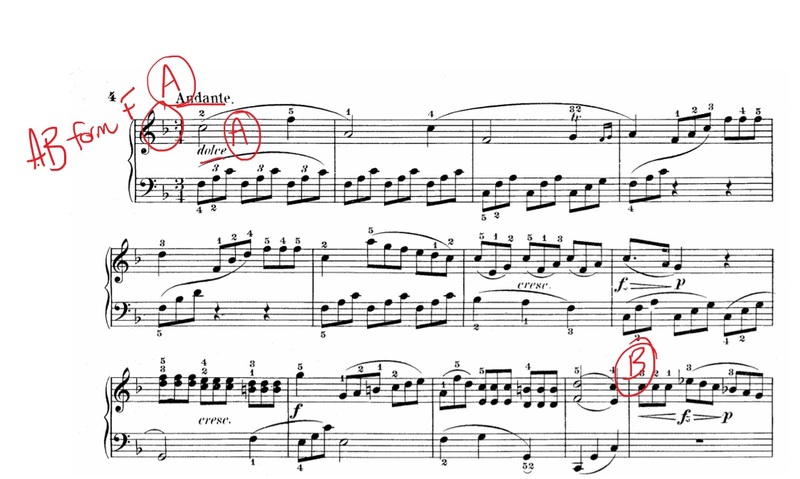 The first movement of sonatinas are almost always written a shortened, simplified version of sonata form. Make sense? After the first movement, you’ll often see the traditional slower movement in the form of a minuet (or the faster scherzo), and the final movement (if there is one) might be in any number of forms, including theme-and-variations or rondo. For examples, we’re going to take a look at two sonatinas today – one by Clementi, and one by Kuhlau. They’re both famous and well-known, and illustrate these points well. Let’s start with the simpler Clementi Sonatina no. 1 in C major (op. 36). 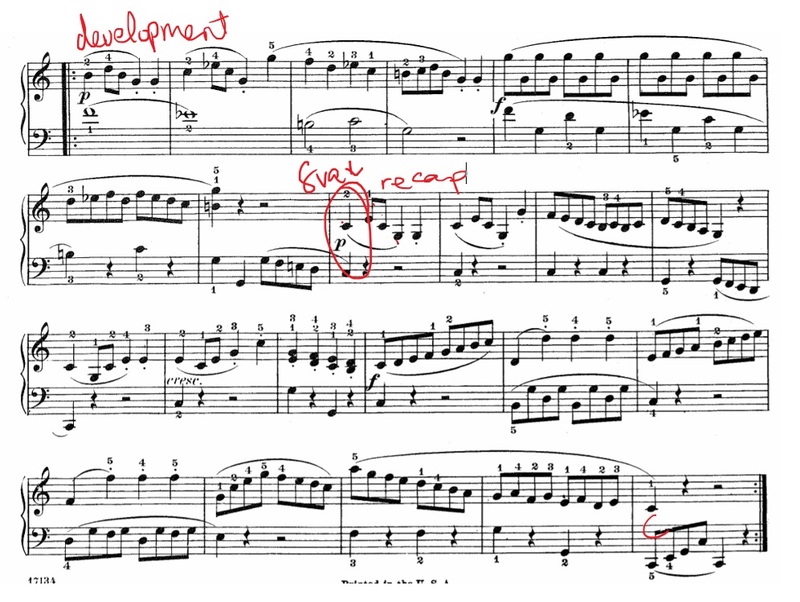 This one is a grade 3 level and has three movements, the first of which is in a shortened sonata form. Let’s look at what that means. Basically sonata form is glorified ABA form (ternary form). You have a main part (A), a different section (B), and then a return to the main part (A). We start off with the exposition, which is the main idea of the piece (A). It’s in the key of C major, and is notated pretty distinctly, because if we look to where the repeat is, that’s a pretty obvious clue that the sound is going to change. So this whole part is our exposition. The double bar lines are a dead giveaway that we’re changing parts, and if we look closely, we’ll see that things are, in fact, very different. Suddenly the overall tone is in C minor, and though there’s a similar shape to the melody, it’s like it’s gone over to the dark side. This is a little teeny-tiny development section (B). So now we just have to hunt down the recapitulation, which will be the exact same tune as the beginning, in the exact same key (C major). There it is on bar 24! It doesn’t look exactly the same as the beginning, but that’s because the right hand moved the tune an octave lower. Otherwise it’s identical, save for a little change at the very end of the movement. 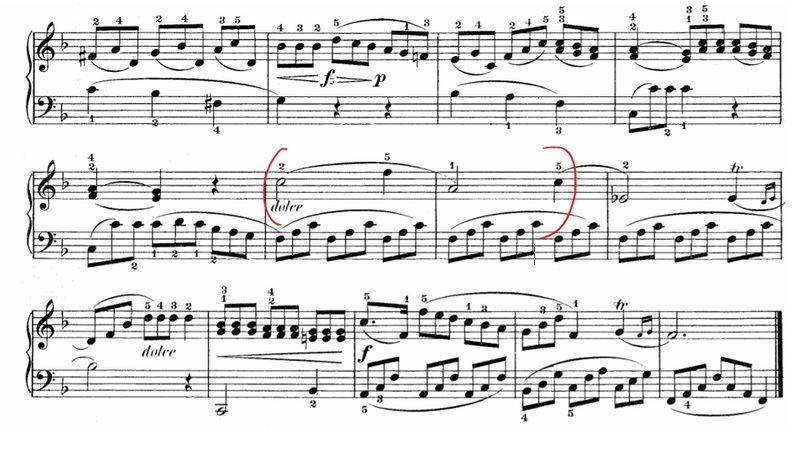 The second movement of this sonatina is your standard slow movement. It’s a minuet, it’s in ¾ time, and is in standard AB form, where the B section (different section) features a short return to the beginning part. The least you need to know for middle movements in a sonatina is they’re usually slow, light and graceful in character. The final movement is typical in its tempo – vivace, which means lively (and I always like to think of as ‘vivacious’). Final movements of sonatinas are generally fast and jolly. A quick look through the form doesn’t reveal anything too complicated – we have double binary form, or ABAB form – here’s the main idea, and here’s the contrasting idea. And here they repeat. I want to take a look at Kuhlau’s Sonatina in C, op. 20 no. 1. It’s at a grade 6 level so it’s more challenging than the Clementi one we just looked at, but still doable for intermediate students. I just want to take a quick look-through of the sonata form of the first movement. Whereas Clementi’s Sonatina had a tiny little development section, Kuhlau’s has a proportionate-sized development section. In sonatas, since they’re so much longer, development section can be pages long. But since sonatinas are shorter, so are their individual components. Which sounds obvious when I say it out loud, but sometimes people think that the little developments “don’t count” because they’re smaller. They totally count! Then check out the recapitulation. It’s almost entirely identical – except, instead of ending in G major like the exposition (and prepping us for the new key of our development section), it simply ends in the key it began – C major. 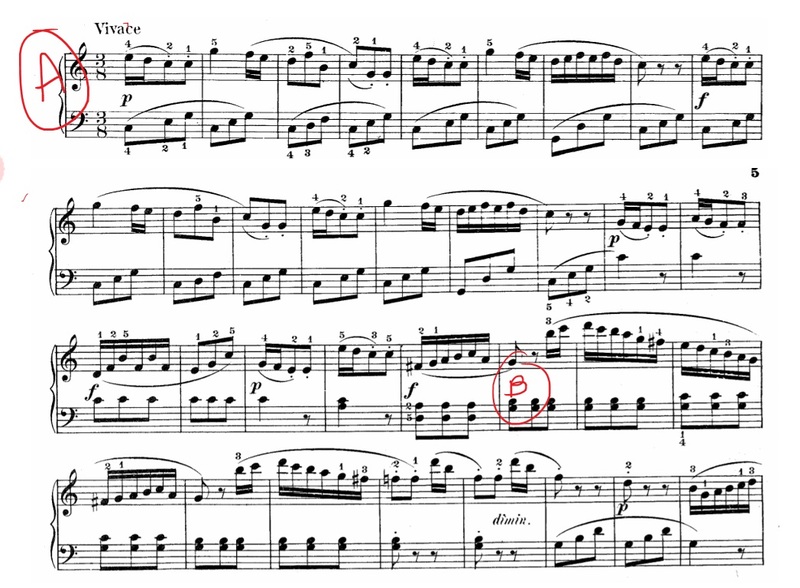 The first movement is followed by a slow middle movement – andante, in 6/8 time, and finishes with a rondo. We’ve mentioned rondos a few times on this channel, but one of these days we’ll have to sit down and have a good and proper chat about it. Composed by Friedrich Kuhlau (1786-1832). Edited by Willard A. Palmer. Masterworks; Piano Collection. Alfred Masterwork Edition. Form: Sonatina. Classical; Masterwork. Book. 96 pages. Published by Alfred Music (AP.4889). For now, the least you need to know is that sonatinas generally have 2-3 movements – the first is in sonata form, the second is usually slower, and the third movement is usually fast and could be in a variety of forms, such as rondo or theme and variations. Thanks for watching today’s episode on sonatinas! Come hang out on Patreon if you’d like to offer your support.